All Glastar grinders are completely manufactured in the USA and come with five-year unconditional no-fault warranty. 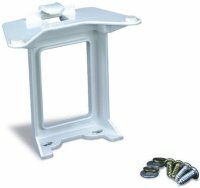 These are the only grinders that meet the stringent standards of the Underwriter's Laboratories. 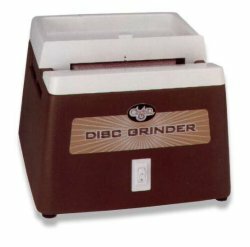 Disc Grinder - For fast, straight line grinding or for outside curves, you can't beat this one! 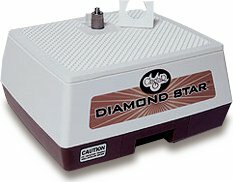 The Diamond Star grinder is a great choice for the beginning hobbyist. Hassle-free performance at a reasonable price. 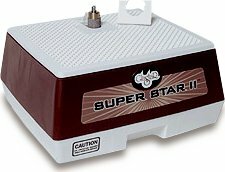 The Super Star II grinder is the perfect choice for the artist or hobbyist. "The standard all other grinders are judged against." The All-Star grinder is the choice of art glass professionals around the world. 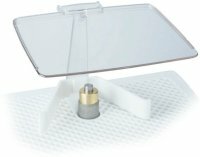 This is the only grinder on the market which provides a water pump up to the mini table to give you sufficient water coolant when working with a 1/4" or 1/8" grinding head. Check out these features. When you click the "Add to Cart" button, we will special order the machine for you. Allow 10-14 days for delivery. The first efficient disc grinder available on the market. Perfect choice for artists who regularly need to make accurate straight edges, such as for boxes, lampshades and panels. 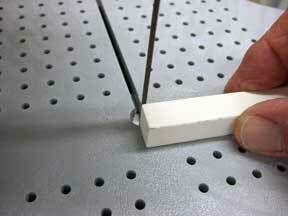 Rejuvenate worn diamond grinding bits by grinding a bit off of this dressing stone. The stone will sharpen the diamonds and will remove build up resulting in a restoration of cutting action. Stone is ½x½x6 inches long. Good for many, many bit treatments. 3/4 and 1" bits in standard, fine and coarse. Novacan is specifically formulated for the stained glass industry. Prolongs bit life without nasty petroleum distillates. Non-toxic. Add four capfuls when ever you change your grinder's water reservoir. Sold in 8 oz bottle.